The supplement that you’re about to sprinkle into your morning smoothie could pass as any nutritional powder, such as protein or collagen — except it’s not. 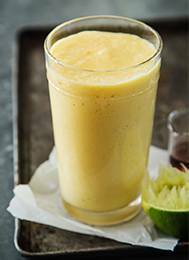 It’s powdered cannabis that easily dissolves and medicates any food, such as our coconut mango smoothie. A scoop of Mondo, for example, delivers 5 mg of THC. Made from the strain Blue Dream, Mondo, according to its manufacturer, is a “perfect mix of balanced full body relaxation with a gentle cerebral invigoration.” In other words, a functional high that users say helps reduce anxiety, stress and depression. The technology in the manufacturing process binds cannabis to coconut oil and cacao, resulting in a powder with a slight cannabis flavor. Whether it’s dissolved directly in your mouth or added to food, the weed taste dissipates quickly and kicks in faster thanks to the science behind the product. The powder also takes the guesswork out of dosing, making cooking with cannabis easier than it’s ever been.